Cultivate and expand your jazz vocabulary while gaining mastery of the most commonly used 7th chords and chord progressions in jazz. The Language of Jazz: A Repository of Melodic Ideas and Linear Constructions includes a series of 17 books containing an abundance of melodic material that you as an improviser can readily incorporate into your jazz arsenal. These 17 books contain more than a thousand uniquely designed phrases and musical ideas in all 12 keys, constructed from the root, 3rd (or 4th), 5th, 7th, and non-chord tones. Each book also includes exercise pages to create your own musical phrases and ideas over the chords and progressions. 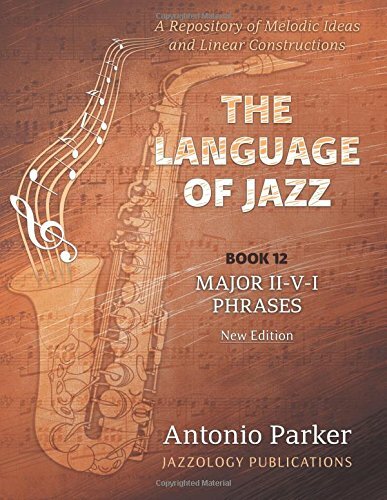 The Language of Jazz Series (books 1-17) is an improvisational resource for beginning, intermediate, and advanced jazz musicians. It provides fresh melodic material that can be incorporated into your daily practice and used to supplement your ongoing jazz development. Book 12 focuses on Major II-V-I Phrases. If you have any questions about this product by Jazzology Publications, LLC, contact us by completing and submitting the form below. If you are looking for a specif part number, please include it with your message. By Brand: Mel Bay Publications, Inc.